I guess I still have some skins left in my brain! Aventine features a gorgeous turquoise base with dark accents. While still decorative, the white explorer windows and subtle buttons will never get in the way of your productivity. I built this skin in windows 10 with Start10 and OldNewExplorer applied. OldNewExplorer gives you back the UI of windows 7 in your explorer windows and I highly recommend the app for the continuity of the windowblinds experience. The skin will however look "fine" without it as well! 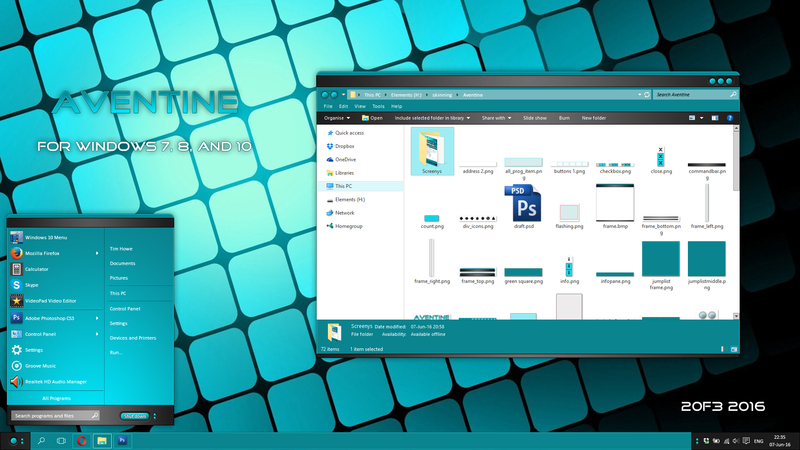 This skin is also tested by myself and Dave Bax for Windows 7. Please enjoy this free skin with my compliments! Soooooo well done. Quality all around. Love this one. Thank you kindly for adding the dark font subs. BTW, where is the wall? Great skins but you haven't stopped skinning! Sintrone is a great skin too! This is very nice, thank you! By the way is the wallpaper also available? Thanks, folks! Had a great time creating again! @Chasbo: Although Sintrone is a relativly new release, I had been sitting on it for over a year before uploading. Hmmm....the wallpaper. It's something I have had a while and don't have the link to. I could try to use tineye to trace it and if I find it, I'll add a link in the description. Thanks for this, a realy nice skin. I thought I'd be using the white text but the black is better. At least for me. Thanks, folks! Had a great time creating again! @Chasbo: Although Sintrone is a relativly new release, I had been sitting on it for over a year before uploading. Hmmm....the wallpaper. It's something I have had a while and don't have the link to. I could try to use tineye to trace it and if I find it, I'll add a link in the description. I'm glad for ANYTHING you share because it's always MASTER QUALITY! Oh and thanks a lot for the link to that wall!